Hampshire Police have signed up to a 'zero tolerance approach' plan, to tackle assaults on officers and staff. It's the first force in the country to develop its own plan for making sure reports are investigated properly - and victims are fully supported. 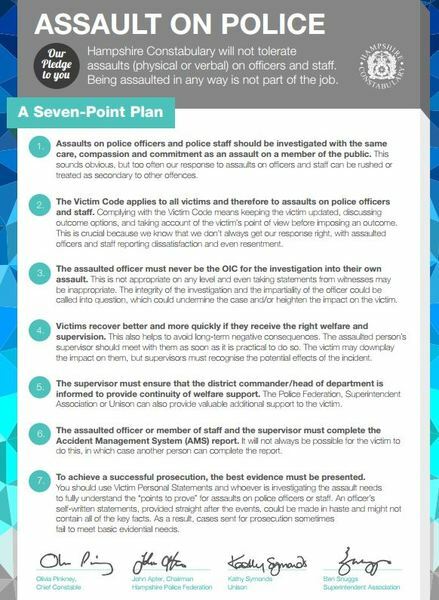 The seven-point plan, which came as a result of the issue being raised by Hampshire Police Federation Chairman John Apter, has been formally adopted by the force and updated to include non-warranted staff members, and verbal abuse as well as physical assault. The pledge has today (Tuesday, November 1) been signed by the Chief Constable, Kathy Symonds from Unison, John Apter, and Detective Chief Superintendent Ben Snuggs of the Police Superintendent's Association. The plan is now being adopted by other forces across the country, including the Metropolitan police who have called it Operation Hampshire, and has been picked up internationally. "Assaults should never been seen as 'just part of the job'. Officers and staff come into contact with people who are sometimes going through the worst experience of their lives, but this doesn't give people the right to ever verbally or physically abuse our people. "An attack on one of our officers or staff is an attack on all of us. If someone is hurt while on duty, the impact is huge. The individual is affected, their team is affected, their family is affected and ultimately the people of Hampshire and the Isle of Wight are affected because that person may not be able to immediately return to duty. "Today, we are committing to doing everything we can to support members of the police family if they are assaulted. We of course are working to do everything possible to reduce these sort of incidents happening, but we must ensure we look after our people if the worst happens." "Police officers and staff perform a difficult and often dangerous job, they deserve to be looked after if they are assaulted while performing their role. Nobody should expect to be assaulted just because of the job they do. "That's why I started this work so that if our officers and staff are assaulted, they get better support and are treated as any victim of crime should be. "Although we have achieved lots over the past two years, the work continues. I want to see tougher sentences for those convicted of assaults on a public officer - such as as a police officer or member of police staff, nurse, teacher or firefighter. Those protecting the public deserve to be protected themselves and this work is helping us to achieve that."